Water is the theme of my journey to Europe this time; it has been a key part of my life so I decided to plan a vacation around it. During my several decades with CMS, I have developed long-distance relationships with firms in Spain, France and Germany so I coupled visits to them along with exploring some water feature icons of the area. I arrived in Geneva via Swiss Air from NYC. The city is five minutes away by train, and the airport issues ninety-minute transportation passes and free Wi-Fi. I choose to take one of the many “water buses” that swing by Jet d’Eau. That is one big water feature! There was a slight breeze, so a horsetail was present. I would imagine the tail is omnipresent at 450 feet in height. While there, I read the following statistics: 132 gallons of water per second are jetted to an altitude of 450 feet by two 500 KW pumps, operating at 2,400 volts, and consuming one megawatt of electricity. The water leaves the 10cm diameter nozzle at a speed of 124 mph. When it is in operation, at any given moment there are about 1,849 gallons of water in the air. Evidently, the Jet d’Eau was originally used in 1886 as a safety valve for a hydraulic power network and could reach a height of about 98 feet. 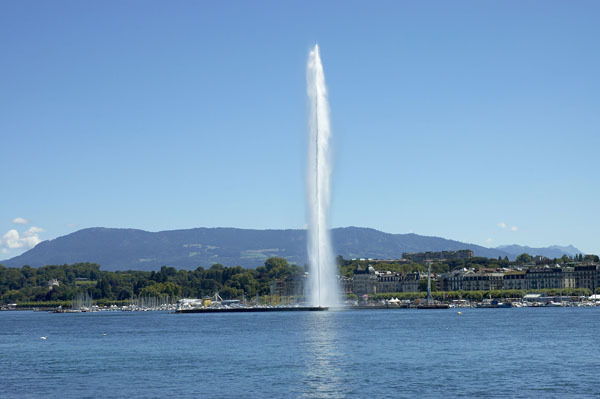 Seeing the possibilities of aesthetic interests, the current Jet d’Eau was installed in 1951 and is now the icon of Geneva. After visiting the Jet d’Eau, I jumped on a bus which traveled toward Mont Blanc. After just one mile outside of the Geneva’s city center, the landscape became green and agricultural. Nearly every bus stop had a decorative water fountain (as in potable drinking) with all manner of bronze sculpted spigots. And although a spigot implies a shut-off, these were constantly running, and I’m told they continue running throughout the winter. Is the water supplied because there are walking trails and it is a public service to provide this basic necessity of life? I walked to my hotel and check in but the restaurant at the hotel was closed – it was after 11pm (how not Spanish). There was a bar a few doors down that was open until 3am. The bar food was excellent – grilled vegetables with a spicy Romesco sauce, and a combination plate with fried white beans, sausage and the ubiquitous toasted bread scrubbed with tomato and garlic. I slept in the tiniest of rooms but it was perfect. The metro system in Barcelona was modern and efficient. 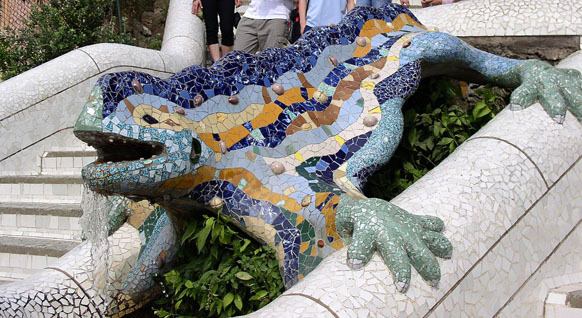 My destination was Gaudi Park Guell, known for its colorful, imaginative tilework. It was off-season, so the explorers are mostly French and American. The walk to the entrance of the park was quite steep; there were three outdoor escalators and I’m grateful to the city planners who installed them. On a high vista point near the park entrance, a narrow spiral path led to a vista of Barcelona to the sea punctuated by the Sagrada Familia and the iconic Jean Nouvel bullet-shaped building. I resumed my walk on paths that were peppered with venders selling the usual touristy trash, but one tempted me with his hand-crafted bicycle tubing wallets. My walk continued to the viaduct area and the Gaudi residence. 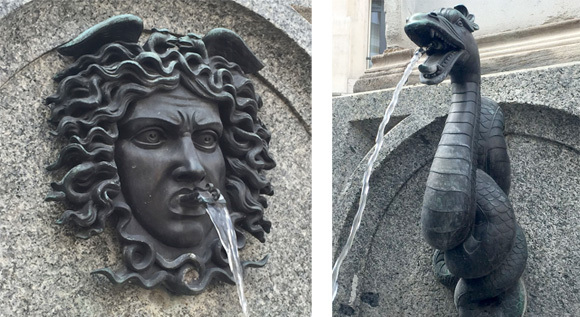 After passing through the gate, steps led to higher levels decorated with sculpted fountains, notably the dragon fountain, which has become an icon of the park. 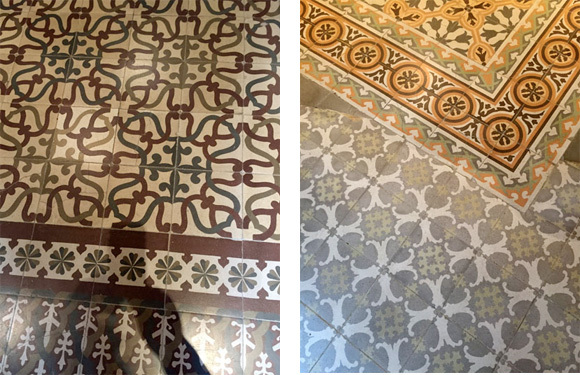 At the residence itself, I was fascinated with the flooring and paving. The designs were delicate and reference botanicals or the geometric symmetry of microscopic sea animals. The interior tiles were under-glazed with stencil-like patterns that reminded me of Hawaiian quilts, but with a very elegant coordination of color. The viaduct creates a kind of canopy or corridor around the residence, and as I walked I heard a rendition of Beatles music but with a Spanish guitar. I stopped to listen and then dancers and singers appeared. It was a unique combination of flamenco and contemporary music that was quite seductive. 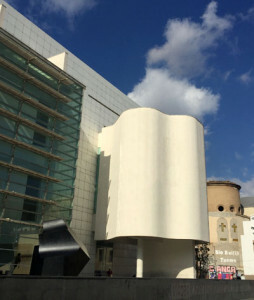 My next stop was the Barcelona Museum of Contemporary Art designed by Richard Meier. The most compelling work was a retrospective exhibition dedicated to Sergi Aguilar, entitled “Sergi Aguilar: Reverse/Obverse (1972–2015)”. His industrial constructions were both familiar and alien. I went back to my room to nap before dinner. My tiny room had an advantage in that the mini bar was free. I had a choice of either the Spanish beer or Heineken: I went for the not-so-cold Spanish beer. I wonder if the temperature a cultural, culinary or energy saving decision. Stéphane Llorca of JML Water Feature Designers met me at the hotel and we walked a few blocks through a nice mixed-use neighborhood to his office. A little note about this meeting: Fifteen years ago, Stéphane dropped me a note of Bonne Anni (Happy New Year). More recently he contacted me to compliment CMS on our work on the Philadelphia Dilworth Plaza water feature. I, in turn, had long admired JML for their work on the Bordeaux mirror, and I had been thinking of creating a trip to Europe with an emphasis on water feature research. So here I found myself in the JML office which is about the size of our CMS office in Santa Cruz, California. I also met Pierre Bertheux, one of the mechanical engineers. JML and CMS are a mutual-admiration society, and are established along the same lines of design only, non-proprietary firms. Stéphane tends more toward the artful and unique role as opposed to the advocate role CMS tends to play in fountain design. Frankly, I was inspired by his wealth of energy and enthusiasm on the subject of water feature design. He related to me that his landscape hero, and one of the original references for design, was Lawrence Halprin. Now I realize this may be part of his interest in CMS, in that we designed a good portion of Halprin’s projects that incorporated water features. I left to go walk the Catalunya Ramblas and Barri Gotic, and also visit the Antoni Tàpies Foundation. Later Stéphane and I met for dinner of tapas, after which we went to the Montjuic Magic Fountain built in 1927. It really was the Spanish Bellagio of its time. The sequence and height of the jets were quite marvelous when you realize it was designed at a time without electronic controllers. The changing light display (added a few years ago) was a combination of prisms, motors and watertight housings for the fixtures. It also must circulate tens of thousands of gallons of water because the water feature is not only the “magic” display, but a whole series of displays that flank and span three city blocks and elevationally flows from a height of 50’ above the lowest basin. After the show, we agreed that we didn’t need to wait fifteen years to be in contact again, and perhaps an opportunity to work together may present itself.